In automotive industry usage of robotic simulation and OLP software is common. Robotics simulation was born in eighties and car producers were first customers of software such as Robcad or IGRIP. Today, they modern versions (Delmia, Process Simulate) based on years of experiences. They allow simulate motion of robots from different vendors and are integrated with data management systems used in automotive industry. Now, you can try to enter to this world. Actually only Abb, Fanuc and Kawasaki allow you to try their OLP software in trial versions. From few days we have new player on this field – RobotExpert from Siemens. During 30 day trial period you can test all his options (including cell store). Besides RobotExpert Siemens sells also Robcad and Process Simulate. To test them you have to talk with Siemens software reseller. There is no demo available (and probably never will be). Both Robcad and Process simulate are destined to „pro” users (Tier 1 automotive suppliers etc.) They are difficult to installation and require complex knowledge about data management. Robotexpert is repacked version of Process Simulate destined to to small and medium companies. Both programs have the same interface, so you know what you can expect from the older brother. 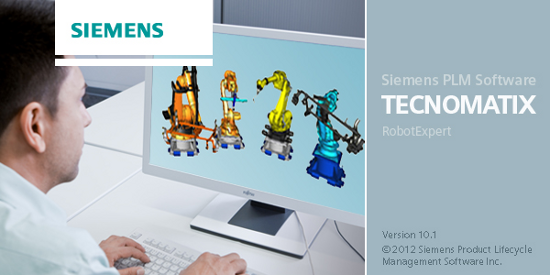 Robotexpert is Siemens answer for Robotstudio or Roboguide. Anyone should handle with installation and basic usage. I heard that robotics engineers are not convinced to RobotExpert. Many of them prefer to use software provided by robot vendor. It is difficult to find robot producer which doesn’t provide tool for simulation an OLP. If you buy robot you always can count on cheap (or even free) simulation software. There is only one exception – Universal robots, but this is a little bit different story, so I can’t blame them for this. Besides price, software added by robot vendors is often (always?) more powerful then universal software. Ok, there is no possibility to simulate different robots, but let’s say the truth: in small and medium companies there is usually one robot provider. So different robots is not a biggest problem. You have to remember that RobotExpert doesn’t allow perform spot welding process. Siemens says that spot welding is used almost only in automotive. Of course it is not true, I saw recently small (2 robots) spot workcell used to production construction equipment. Robotic simulation was done in Roboguide. Free demo is a good importunity to comprise different applications. Plus for Siemens for example cell included. They prepare also introducing videos about application usage. Giving customers a demo is a brave decision. I’m afraid that many customers after tests will stay with software provided by robot producer. The biggest advantage of RobotExpert (different robot simulation) is not too valuable for small and medium companies. When you are small you use software from robot vendor. When you grow up and look at side of automotive industry you need serious tool. There is not too much place for software like RobotExpert. Low popularity of RobotExpert confirms forum available for trial program participants. Few days after start trial program only six persons read inviting post. In my opinion RobotExpert is interesting solution if robot producer provide weak simulation tool. I think that Siemens software will be popular among students. They receive free tool which helps them to understand how works robotic simulation in automotive industry. is there any trail version available for Robcad not RobotExpert ? if it’s available please let us know…..
Robcad is at the end of his life. You could ask someone from Siemens Industry Software for test version, but there is no demo version available for „normal” download.